"This a weekend project, but the good news is you're not going to be in the workshop the whole weekend!" The entryway of a home is the first thing you see when you walk in. This time of year, the entryway is often muddy and messy, with wet coats lying around everywhere. 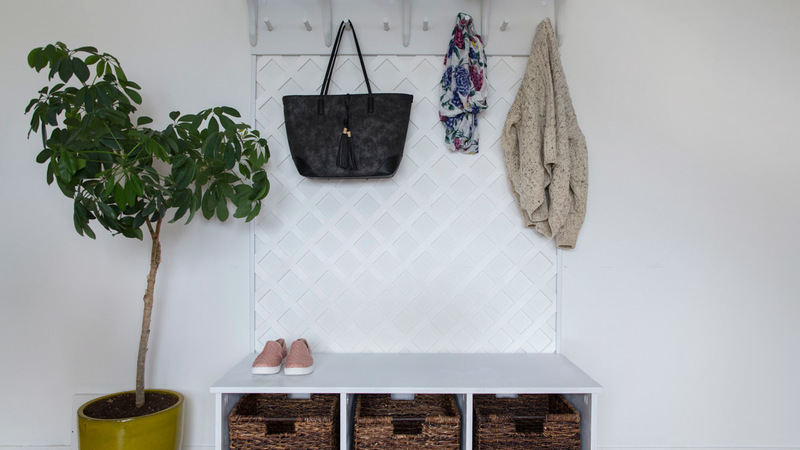 This coat rack is a pick-me-up for your entryway, and by “pick-me-up,” I really mean a place to pick up your coats and put them away. It’s part of our "Intro to Spring" series, along with last week’s boot tray, and the bench we’ll be putting together next week. We borrowed the idea for this project from Deckorators, a brand Dunn Lumber carries that makes decking and railing accessories. 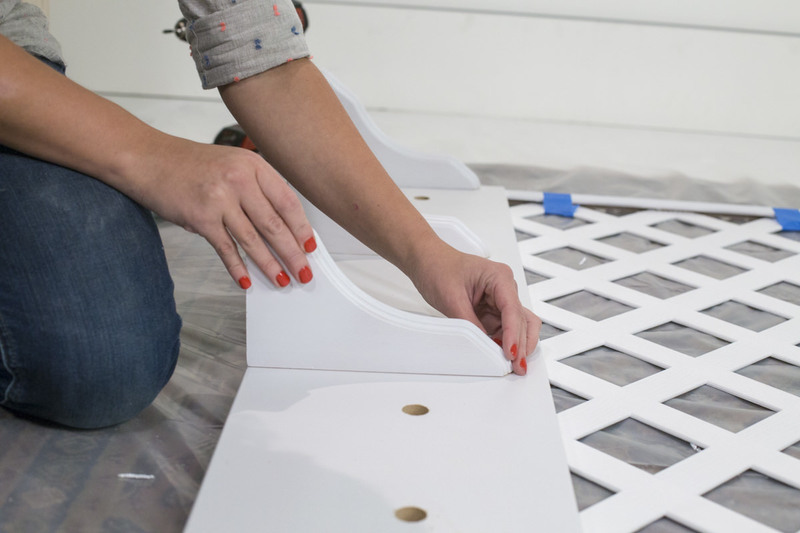 The project uses a vinyl lattice panel from their line, which comes in white or paintable gray colors. The white version can’t be painted as the paint won’t adhere to the surface, so for this project we’ll be painting the other elements white to match. This isn’t a hard project, but it is one where you have to be patient. There should be a pause between each of the steps, which will allow everything to dry. If you don't like being patient and you try to rush the dry time, it's going to turn out less than photo-worthy. It's a weekend project, but the good news is you're not going to be in the workshop the whole weekend! Call it a 48-hour project with four hours of actual work time; the other 44 hours it’s just sitting on the floor somewhere drying. Cut the lattice with a circular saw to 48” x 62”. For cutting big pieces like this lattice, you want to use something like a circular saw that can move across the whole length and go exactly where you guide it. The lattice is awkward and intimidating to cut, because it's very floppy and needs a lot of support. You can't just hang it off the end of a table, because the lattice will bend and wobble. You need a chair or something similar to support the other end; support keeps it lying flat. I used clamps to keep it tight to the table and stop it from moving, but I had to move those around as I was sawing. At the same time though, it's super easy to cut, because it's very thin and made of plastic. The saw goes through the lattice like butter. 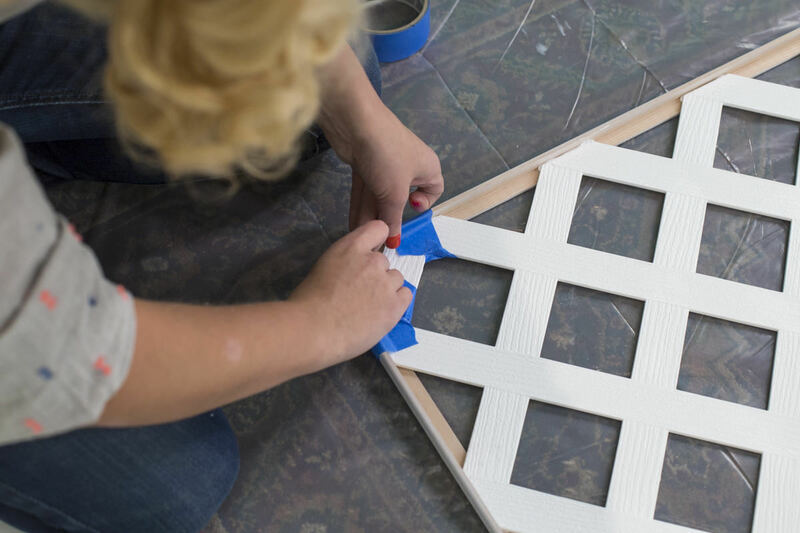 The part that goes around the edge of the lattice is called corner moulding (because it forms a corner). 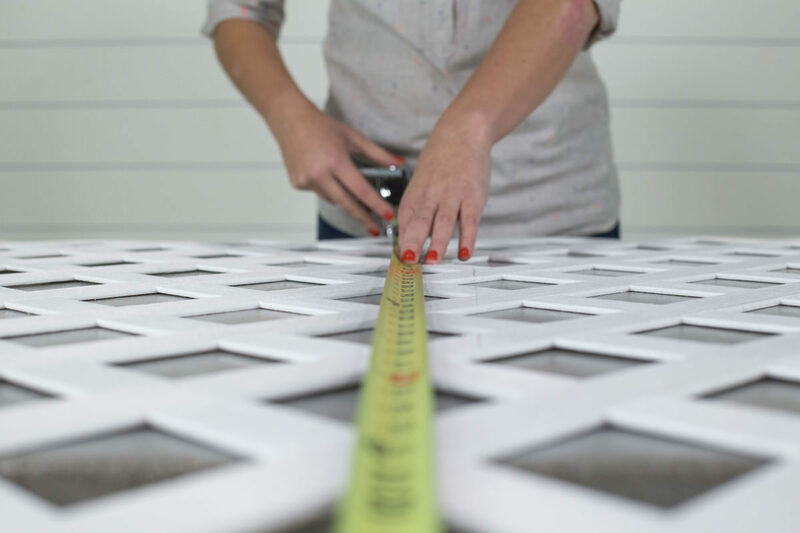 Cut three moulding pieces to frame the bottom three sides of the lattice with a miter saw set at a 45° angle. The outside lengths should be 60”, 60”, and 48”. No matter how much I think about it, I still consistently mess up cuts like this. Take twice as much time as you think you need, and really visualize what you want to achieve here. 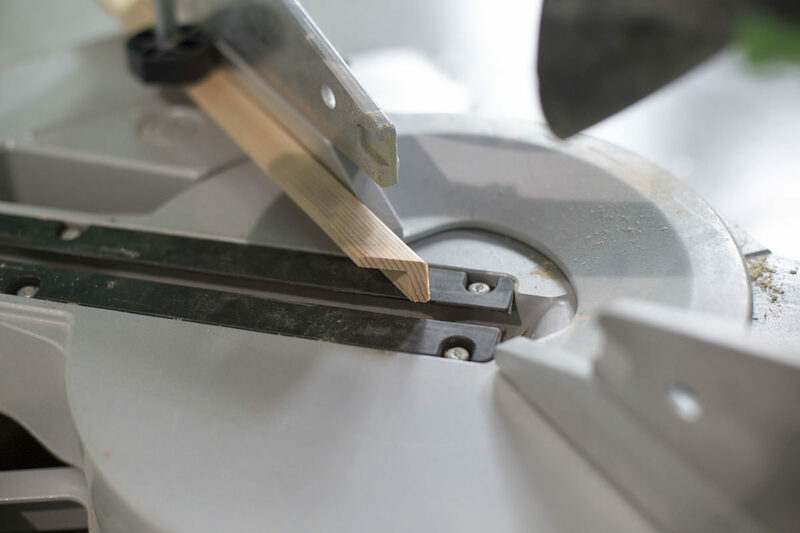 The "measure twice, cut once" policy is key when cutting moulding. The boards we used are MDF, which stand for medium-density fiberboard. 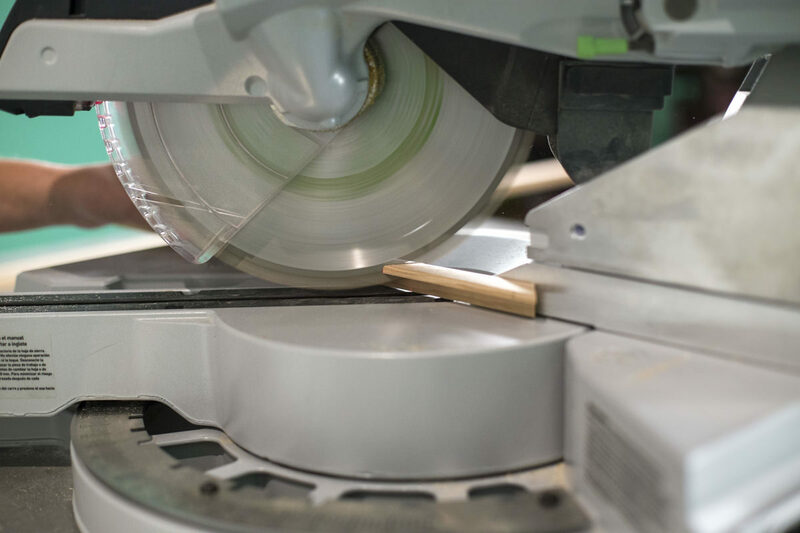 MDF is made of wood fibers that are blended and glued together. 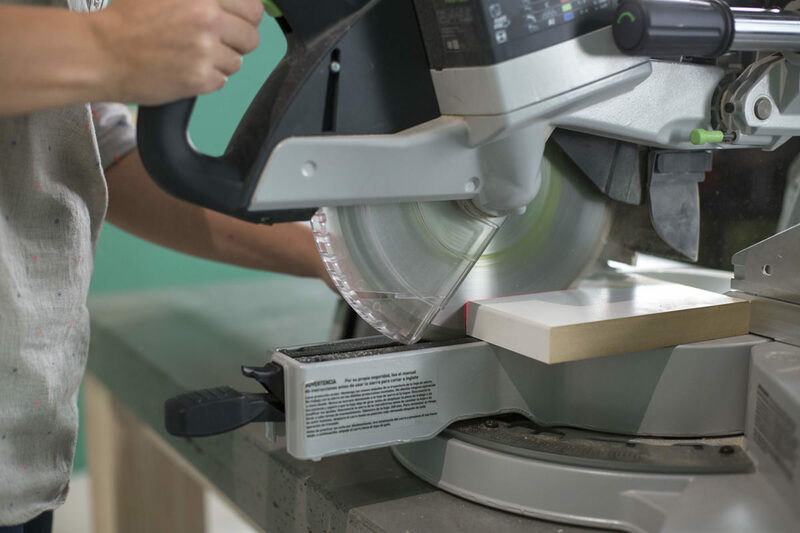 Start this step by cutting the two pieces of MDF to 48”. 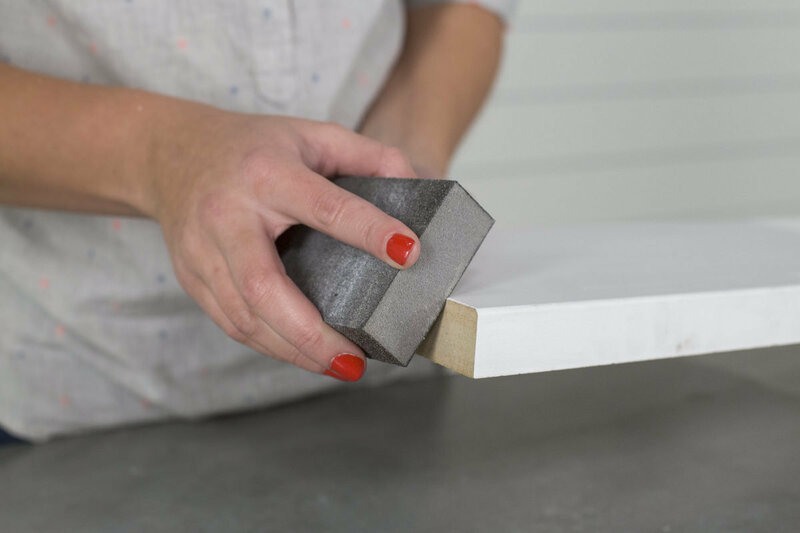 The dowel comes in one big, four-foot length, and you’ll use a miter saw to cut it into little pieces. Clamp it in place, and cut the ¾” dowel into eight 4 ½” pieces. 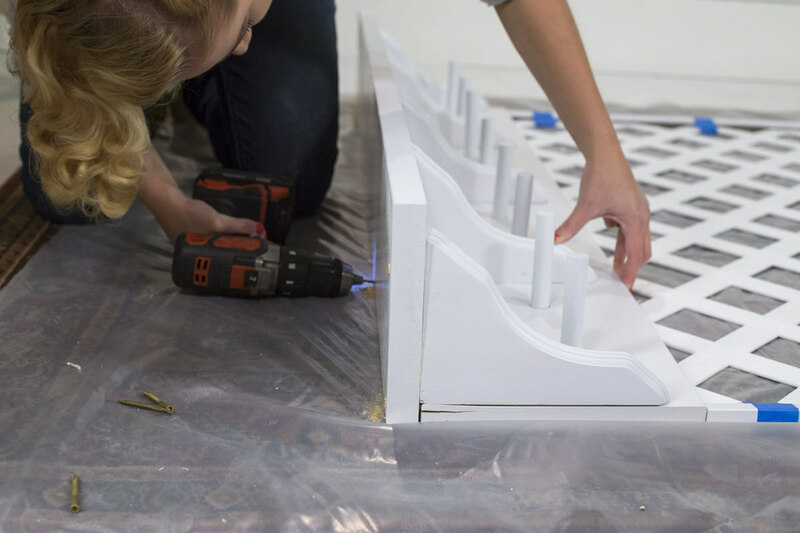 Once everything has been cut, sand any rough ends—primarily the MDF and the dowel cuts. 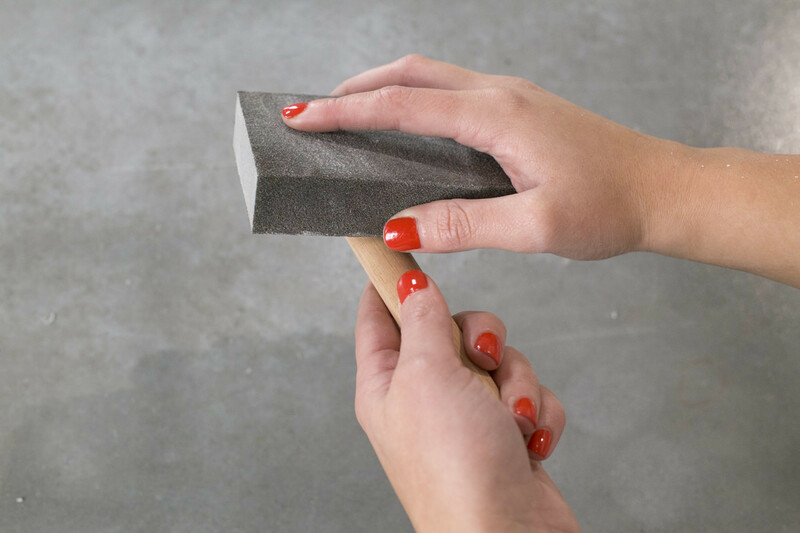 MDF doesn't splinter like normal wood, but it does have very sharp edges. Sand those, and any rough spots in the primer. Also sand the ends of the dowels, which do tend to splinter. 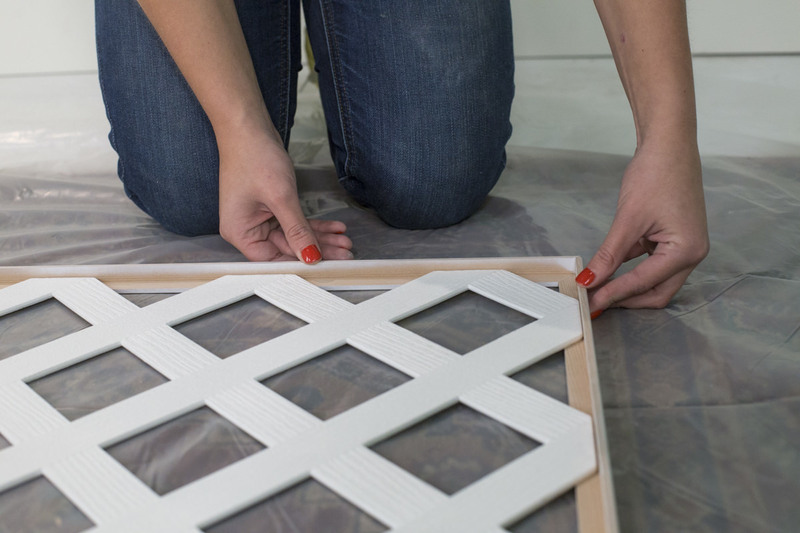 If you chose to use the white pre-painted lattice, paint the rest of the pieces to match. 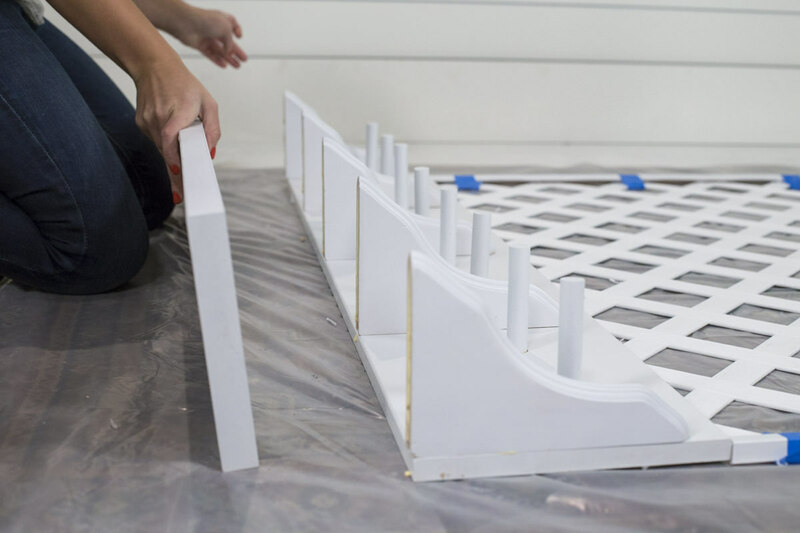 If you chose the unpainted lattice, get ready to paint everything (the MDF, the moulding pieces, the shelving brackets, and the dowel pieces). 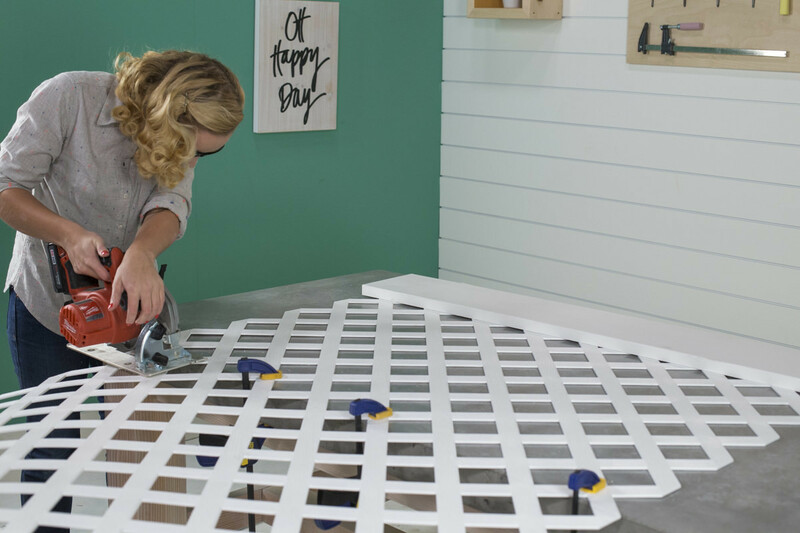 Deckorators recommend that you paint the lattice with spray paint, so we decided to use that for everything involved. 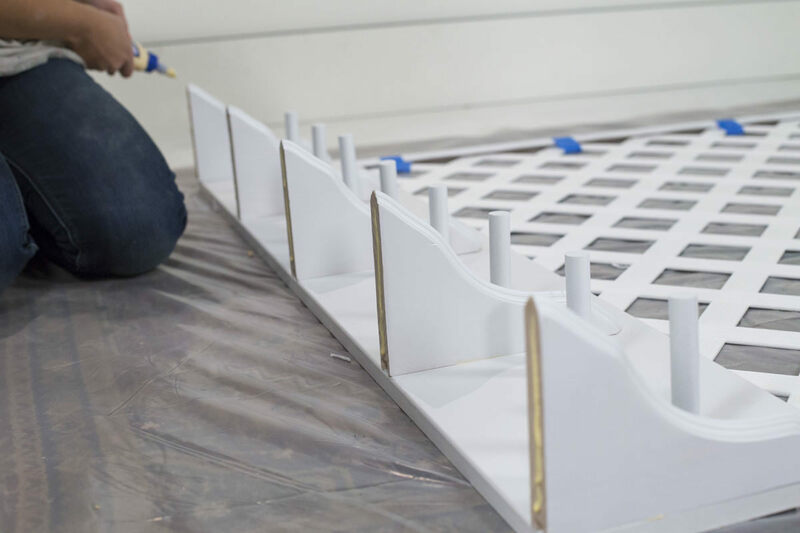 Using primer first is the best way to ensure your paint adheres and dries properly, and with aerosol paint—it really doesn't add extra time. 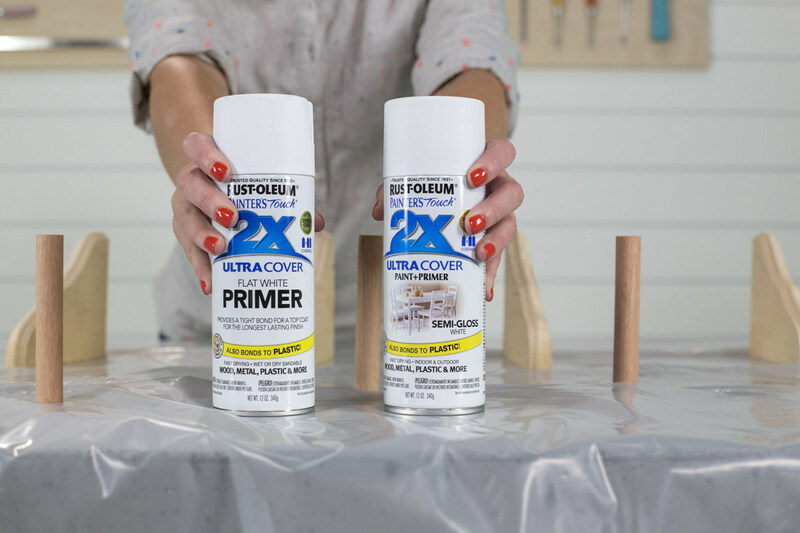 Unlike a brush-on paint, you don't have to wait long for the primer to dry before you start painting. If you're impatient like me, this is the way to go. Allow ample time for everything to fully dry before moving forward. 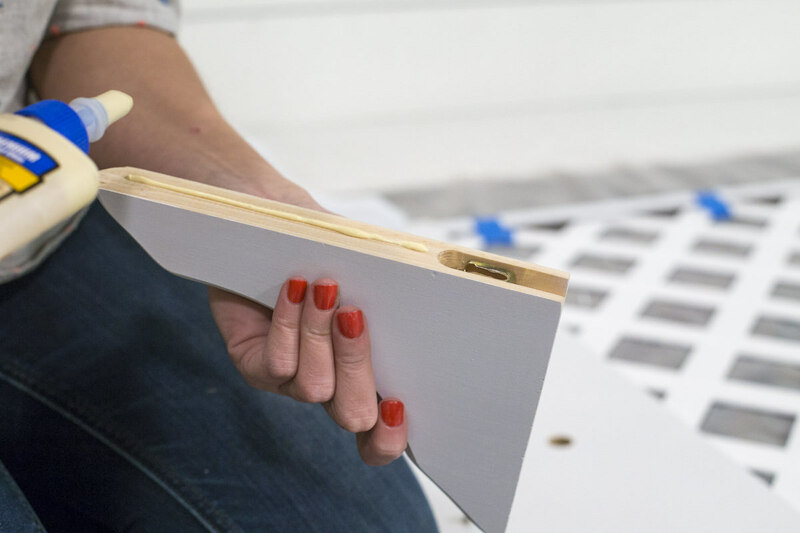 Take the 1” x 10” MDF. This will be the backboard of the shelf. Measure four inches up from the bottom, and mark for dowel hooks at 3”, 9”, 15”, 21”, 27”, 33”, 39”, and 45”. (This puts the dowels six inches apart from each other, with two dowels in between each set of shelf brackets.) 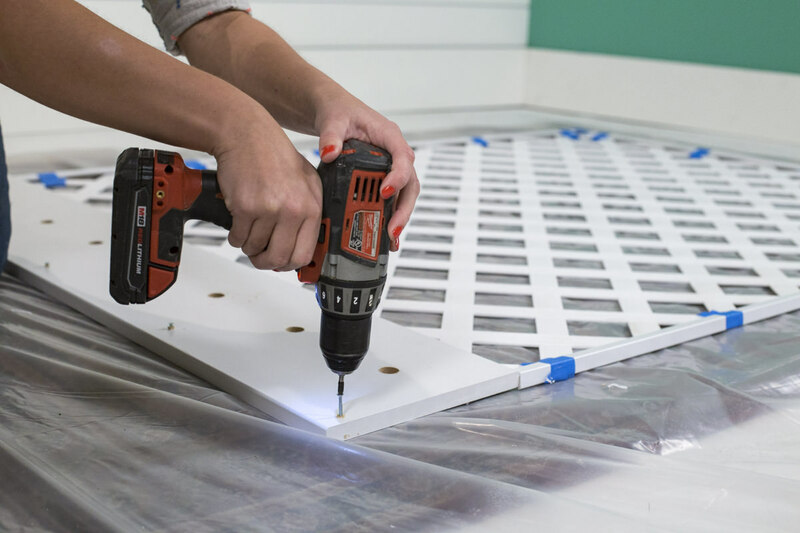 Drill holes with a ¾” drill bit. You can tape off your drill bit to make sure you don't drill all the way through the material. This will give you a backing to glue your dowels onto and make them extra secure. Dowels vary ever-so-slightly in size; each one is just a little bit different. 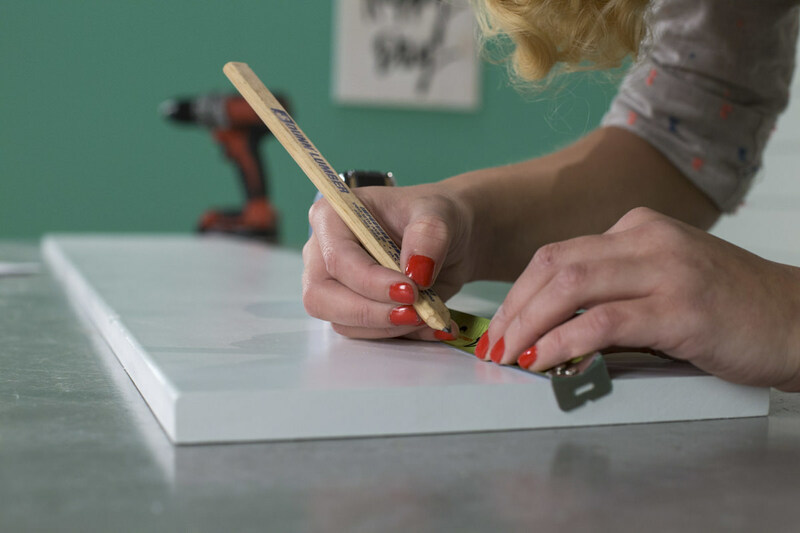 When you’re fitting them into a hole, those little discrepancies can be the difference between the dowel being snug or kind of wiggly—or being too big and not fitting in the hole at all. I've found the most effective way to get a snug fit is to take your drill bit and drill a hole in a little piece of scrap wood, then take the scrap wood to the store and fit dowels into it until you find one with a good fit. Buy the one that fits! Sure, you’ll look a little silly, but you’ll have the glass slipper of dowels. Measure down one inch from the top of the board, and mark ½” from either end and at every one-foot marker (12”, 24”, and 36”). These will be the marks for the shelf brackets. 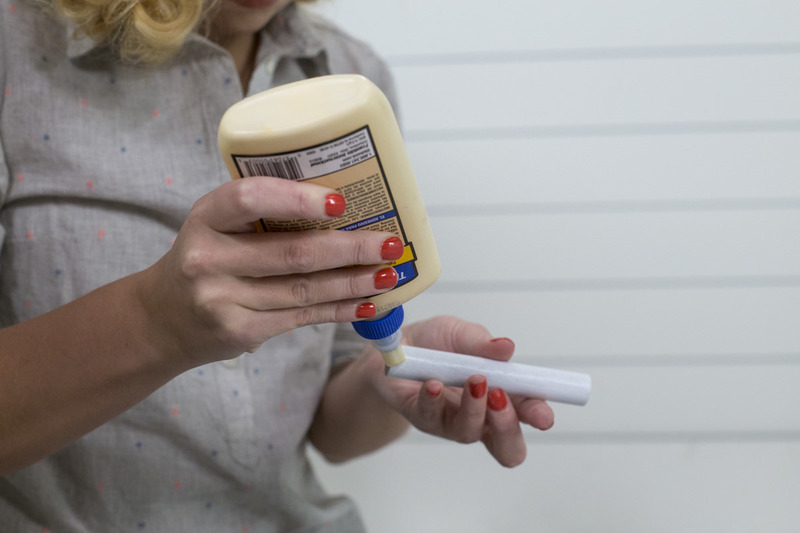 We used caulking adhesive for a few reasons. It comes in white or clear, so it blends in with the rest of the pieces. We had some left over from the bat house project, and didn’t want it to go to waste. The kind we used comes in a tube with a cap on the opening that you can put back on, as opposed to the kinds that come in a cylinder and will dry out after the first use. We attached the molding so that it's underneath the lattice, so that as the glue is drying it’s being weighted down by the heft of the lattice (not that the lattice is that hefty). Line up the top of the moulding with the bottom of the backboard (also lying face-down) so that the lattice overlaps a couple inches and the moulding butts up against the bottom of the board. Pre-drill the lattice with an oversized bit* and secure with screws. *An oversized bit means that it's just slightly bigger than the screw you're using. Normally, you go in with a drill bit that's the same size as the shaft of the screw (the part inside the ridges), but in this case you’ll go with a screw that’s the same size as the ridges. The idea being that it's not securing into the lattice the same way that it would into wood, but the head of the screw itself is what’s keeping the lattice attached. This relieves a bit of the tension on the lattice since it’s a little more delicate than wood. Normally, you’d measure a drill bit to a screw by holding up the screw behind the drill bit. If you can see the threads sticking out behind the drill bit, that's the right size. In this instance, hold it up and make sure you can't see the threads behind it. Keep in mind: Don’t over-tighten the screws. Basically, the general concept is that you don't want to put a lot of pressure on the lattice. If you over-stress it, it's going to break. Drill in five 1” screws with approximately 3/8” of the screw sticking out into the five pencil markings. These are for the shelf bracket to hang on. Apply glue and hang the shelf brackets on 1” screws. Apply glue to the ends of the dowels and fit them into their holes. Allow the glue to dry! With glue and screws, attach the 5/4” x 8” MDF on top of the shelf brackets to make the top shelf of the coat rack. 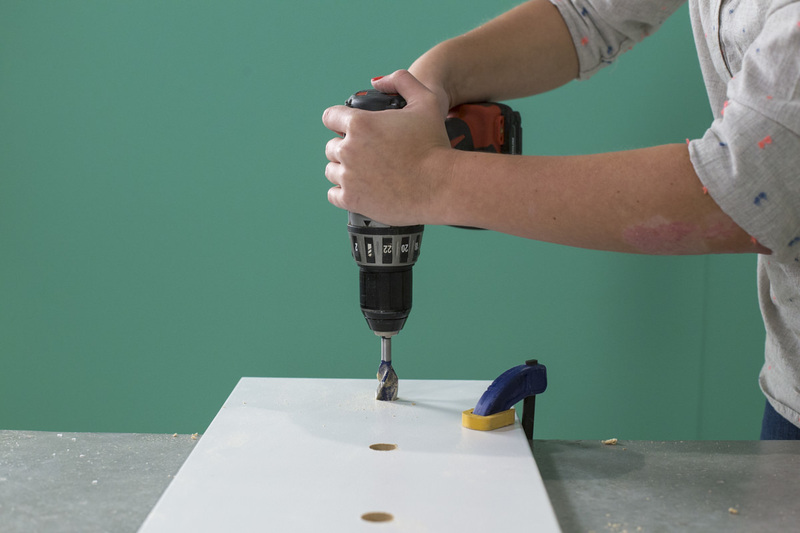 Fit dowels into the ¾” holes and glue in place. 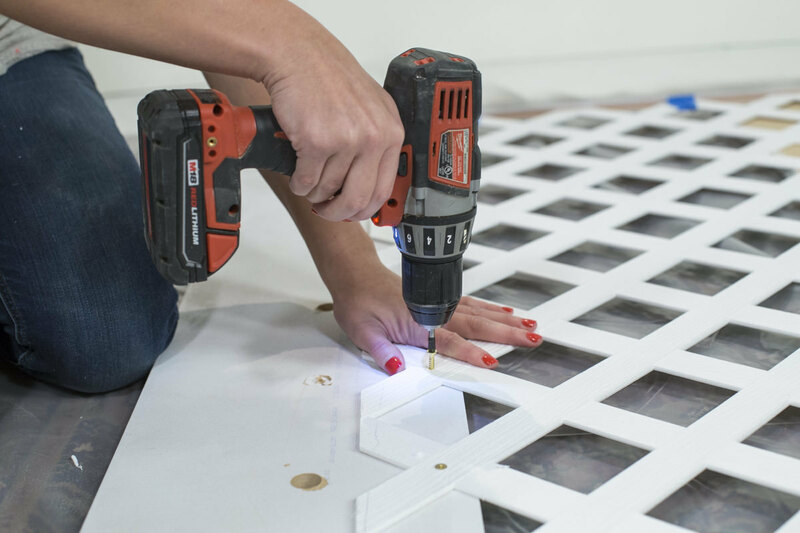 Fill the screw holes with spackling compound. You don't need to fill them with spackling, but if you want it to look really finished and professional, you can. 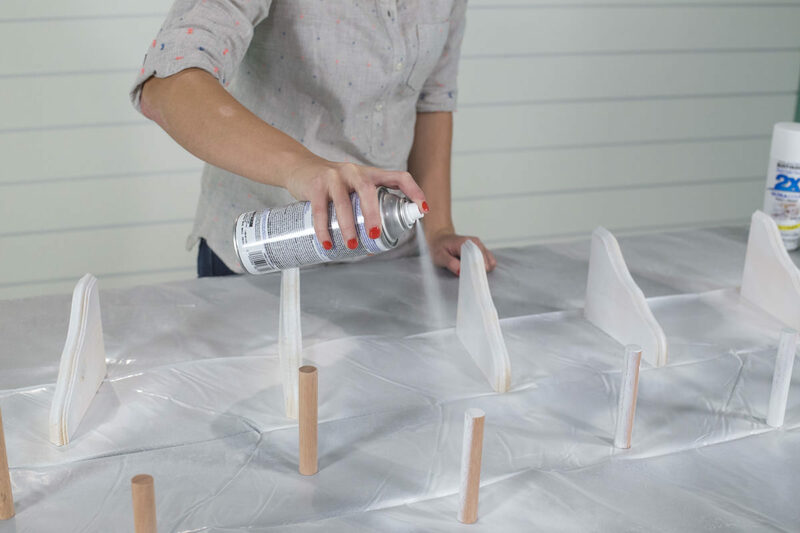 Allow the glue to dry, and make paint touch-ups as necessary. 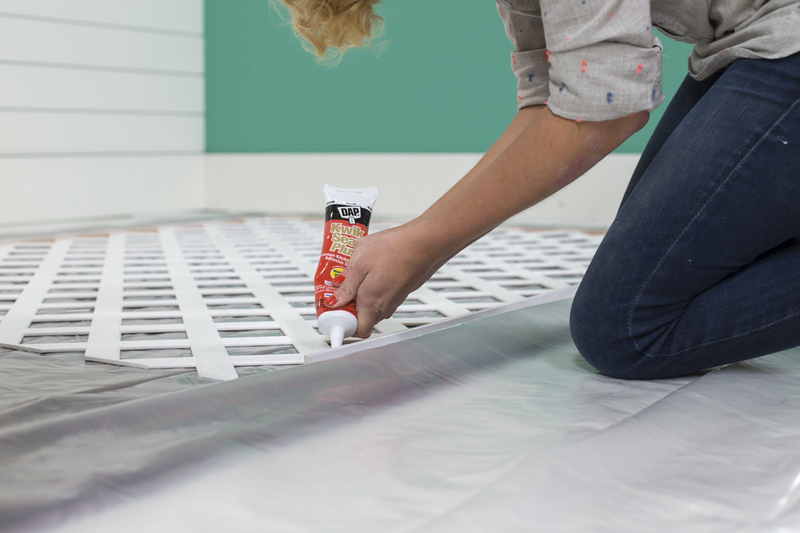 Rust-Oleum Painter's Touch also comes in a brush-on version (in a 1/2 pint can), so that you can buy for this. Attaching the bench to the wall is fairly easy. 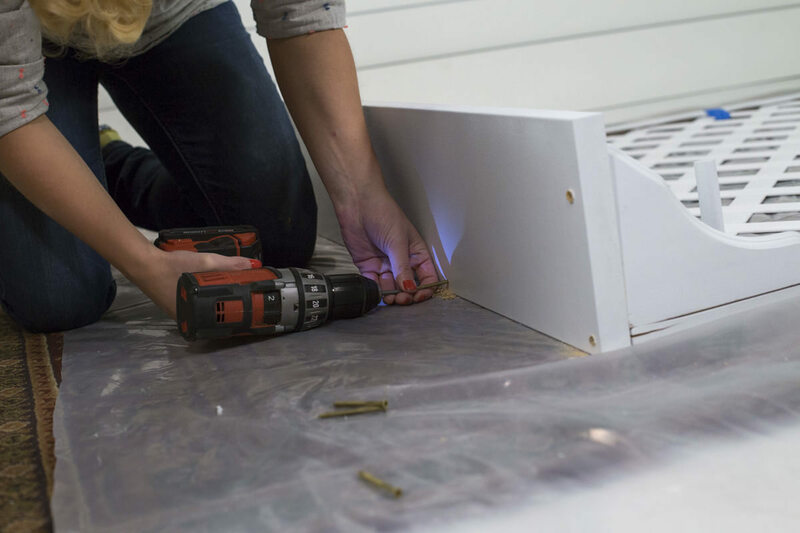 Just find the studs in your wall and screw through the backboard near the top of shelving and into the wall. You can cover the screw holes with spackling and paint. That’s it! You’re ready to hang up your coats. Larger projects like this are probably the hardest for me—and more intimidating than a normal project—because they require more patience. But it's a great lesson to learn that if you have space to leave a project like this while it’s not being worked on—like if you leave it in your garage and park in your driveway for a weekend, or stick it on the back porch on a sunny day—it's really not a big deal. Out of sight, out of mind. 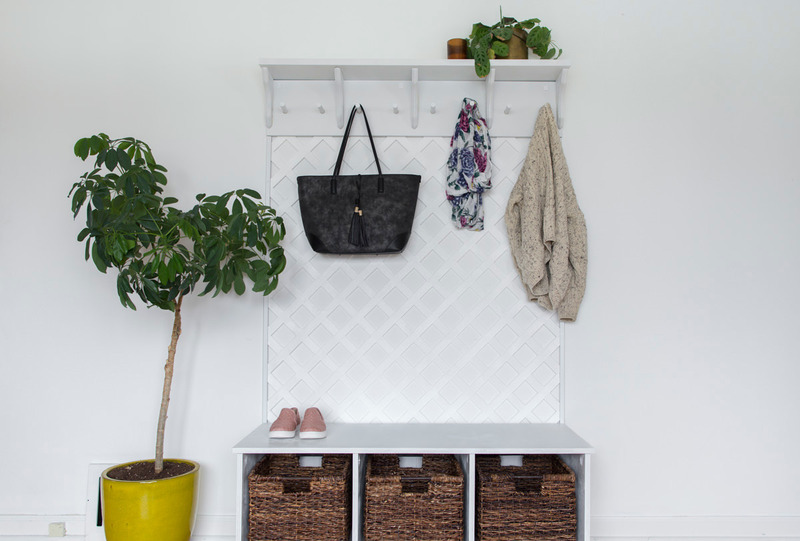 And by Monday, your entryway could be totally transformed!